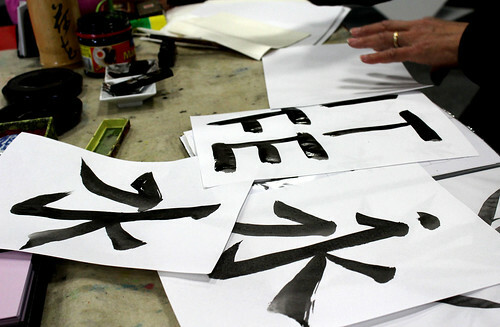 Master Chinese calligrapher Stan Chan spent an afternoon painting at the National Library of New Zealand Chinese Language Week. He translated people’s names into Chinese calligraphy as well as explaining the skill behind his art. “The ink block is actually like charcoal. You mix it with water to make ink,” Stan explains. Stan has been painting since he was 10, shortly after his family moved from China to Hong Kong. For the next 46 years, he set out to paint and teach in New Zealand in his Wellington art studio, inkLink, which he set up in 1979. Some of his demonstrations included a kiwi, a panda and bamboo. “That’s 50 years in one minute,” laughs Stan. He says his favourite part about his job is teaching others. “Using the word teaching seems I’m being very proud of myself,” says Stan. Stan has art classes in Wellington for people ranging from under 10 years of age to over 60.